Replenish dry, winter skin with a super easy to make sugar scrub. I absolutely love this DIY, I use it at least once a week. 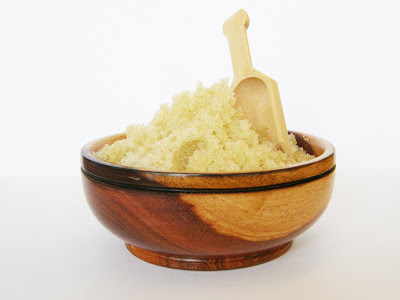 The organic sugar provides gentle exfoliation, while the alph-hydroxy acids found in it naturally tone the skin. a few drops of essential oil; suggestions - lavender is great for night-time, mint is a great wake-up! NOTES - go slow with the oil, you don't want too much in the mixture. I don't add any colourants, it's natural, so what's the point? Keep the mixture in a resealable jar, use a few spoonfuls per scrub!